Sprout Social is excited to introduce Suggested Replies for Twitter—the latest addition to our engagement toolset powered by advanced machine-learning technology. Available in the Advanced plan, Suggested Replies enable social customer service agents to quickly and efficiently respond to recurring inquiries. This new feature, born of a #SproutHackWeek project, assists teams with maintaining a consistent brand voice while still providing the authenticity audiences expect. What Are Twitter Suggested Replies? A customer sends your brand a message on Twitter. Sprout analyzes the message and finds recurring content. Sprout analyzes the responses to that message and finds recurring content. 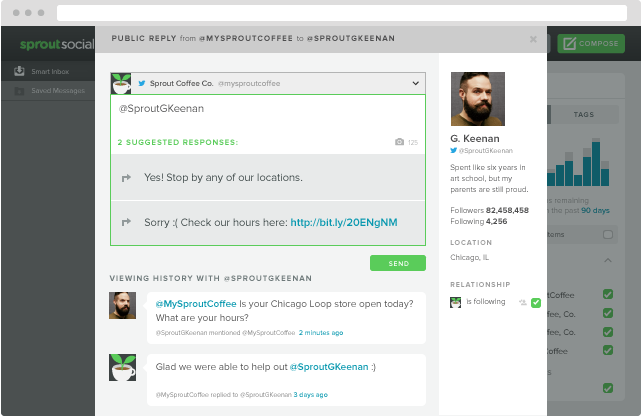 Sprout suggests replies you have previously used. Choose a reply that best fits your intended response, and it will pre-populate into the response field. Edit the message to tailor it to the sender, add additional details or just make it more authentic so you don’t sound automated. Sprout’s Suggested Replies are much smarter than canned response functionality you may have previously used in another platform, which takes time to aggregate, find and paste. Canned responses are a library of macros or saved text built and maintained by the user that are standardized and impersonal. Canned responses are meant to create a uniformity of replies that don’t allow for—whether due to time constraints or approval process—personalization of responses. Twitter Suggested Replies are offered only when a match between messages and replies is detected by the algorithm. Users then choose a relevant response based on the needs of each individual message and edit the content for a personalized experience. Sprout’s algorithm is always learning based on your recent responses, so the more you use Sprout to engage on Twitter, the better the Suggested Replies get. How Should I Use Suggested Replies? 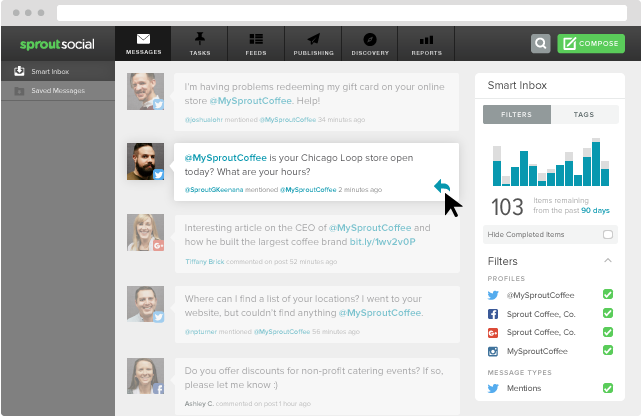 If you have a social customer service team, response rates and times are important. Customer service teams use Suggested Replies to efficiently respond to commonly asked questions. Agents can select the best Suggested Reply and edit the message to make it more authentic or add additional details. Twitter Suggested Replies cut down on response time and improve overall response rates. This is especially useful for teams with a high volume of incoming messages or skeleton crews. If you have a large social media management team, a unified brand voice is key. Social media teams use Suggested Replies to maintain consistency and share knowledge. Team members can select a Suggested Reply and edit the message to personalize the response. Suggested Replies continuously update based on replies sent, so team members can select previous responses containing the most accurate information without sounding automated. This is especially useful for large teams with varying levels of experience. How is your team using Twitter Suggested Replies? Leave your use case in the comment section, or let us know if you have any questions.